The Gro Company are our longest-standing partnership and market-leaders in baby sleep bags. 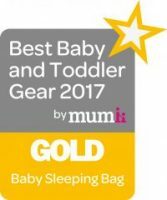 The Lullaby Trust recommend baby sleep bags as a safer sleep option and have approved and recommended The Gro Company’s GroBag for almost twenty years. Our partnership with The Gro Company began in 2001 due to our shared desire to find a solution to the danger of loose sheets and blankets placed on sleeping babies in their cot. Loose bedding can cause overheating and covering of babies’ heads, which are risk factors for SIDS. The Gro Company originally approached The Lullaby Trust in 2000 for advice on an innovative product they were developing (this product eventually became the well-known GroBag). We were delighted to work with a company so committed to safer sleep for babies, and have worked closely with them ever since. The Gro Company consulted our scientific advisers on the original design of the GroBag in 2001, and have continued to seek advice from them when developing new products and adjusting designs. This is why the GroBag is the only baby sleep bag recommended by The Lullaby Trust. The Gro Company have prioritised safety and safer sleep for babies from the start and in 2005 we were proud that the partnership played a key role in helping to establish a British Standard for baby sleep bags. Not only does the GroBag meet all the relevant safety recommendations for baby sleep bags in terms of its design and construction, we appreciate the extra steps The Gro Company have taken to ensure their sleeping bags are used correctly by parents. 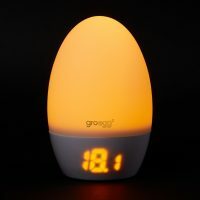 For example, the useful information featured on GroBag packaging to help parents choose the right tog and under-layers when using the GroBag, and the GroEgg room thermometer, to help parents reduce the risks associated with overheating and create a safer sleep environment for their baby. Underarm poppers on 0-6 month sizes stops baby slipping inside the Grobag, ensuring a better fit for smaller babies. 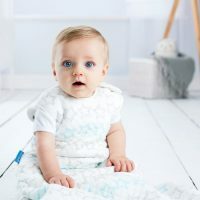 All Grobags are accurately tog tested, they include a free Nursery Thermometer for 0-6 and 6-18 months sizes and ‘What to Wear’ advice on what tog to use depending on the temperature. This advice has been developed in accordance with The Lullaby Trust guidelines. There are four tog ratings available: 0.2, 0.5, 1.0, 2.5 and 3.5 meaning parents can more easily choose the correct weight of bedding according to their room temperature and the weather to avoid overheating. Neck openings are carefully scrutinised to ensure they are the correct size so that babies cannot slip down inside them. Shoulder closing Grobags have double poppers to ensure the neck size does not slip out of shape. Grobags have secret seams – all stitching inside the Grobag is finished so there are no loose threads that could get caught around little toes. The Zip click™ ensures the zip closure is covered, keeping away from soft baby skin and adventurous fingers. Visit the The Gro Company’s website to read their GroBag FAQs for more information about their innovative baby sleep bag. 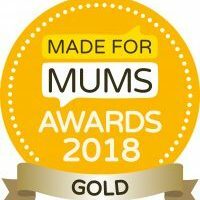 Over the years The Gro Company have demonstrated a company-wide commitment to the work of The Lullaby Trust, donating hundreds of thousands of pounds towards our work as well helping us reach more parents with our life-saving safer sleep advice. In addition to their annual contribution, the team at The Gro Company generously support our work through personal fundraising activities, such as sponsored walks and office bake sales, and even taking on the London Marathon! The Lullaby Trust are extremely grateful for The Gro Company’s ongoing support and dedication to infant sleep safety. We look forward to continuing to work together in the future to help more parents ensure a safer night’s sleep for their baby.